We had an 11 hour flight from Perth to Johannesburg, South Africa, arriving at 5am. Happily, the hotel found us our room early so that we could get a nap in before the festivities started at dinner time. Our first impression of Johannesburg was that of a walled city. Every house had a high impenetrable wall around it, often with razor wire on top, and security signs about “armed response”. There were lots of black people walking along the highways – and lots of white people driving BMWs and Audis and Mercedes Benzes. We definitely weren’t in Kansas anymore, Toto! The hotel itself was sumptuous with walled patios and swimming pools. Strange birds strutted around like they owned the place, and attentive staff made sure we were comfortable. Outside, there was lots of construction, street vendors and cafes. We were told not to visit ATMs by ourselves, and not really to wander about much. Odd, for Canadians. Our first night was all about introductions and dinner at a local restaurant, where we sampled some African food (including fried worms!!!) and got our faces painted. We have a group of 24 (all Canadian except for four Americans and including 3 husbands) on this guided tour organized by Valerie Hearder (Nova Scotian now, but originally from Durban) and Odette Tolksdorf. 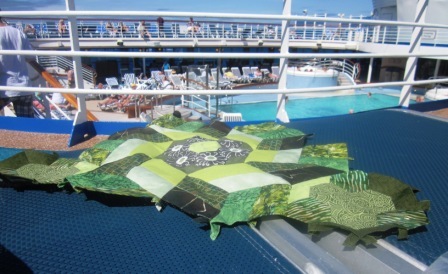 They are both art quilters, and there is a significant fibre arts component to the trip. Val loves her birth country, and has planned this 21 days to show us as much as she possibly can about why she loves it so much. Our suitcases are bulging with embroidery and sewing supplies, reading glasses, knitting yarns and needles and school supplies to give away as we visit some of the projects. We meet our driver, Charles and start with a bus ride to the Cradle of Humankind. This is a really important site for human fossils, some as old as 3.5 million years! It is a UNESCO World Heritage Site, and we got a private visit with one of the researchers at one of the many limestone caves where they do their digging. They only dig for a few months each year, and get enough interesting fossils to keep them busy the rest of the year, identifying and cataloging them. It was the trial by fire for our new bus driver, Charles, who had to drive us on single lane dirt roads in the Rhino and Lion Nature Reserve to get to the site. It was our first day in South Africa, and we saw all kinds of wonderful animals! When we finally got to the site, we were greeted by a table full of hominid skulls to introduce us to our cousins and ancestors. This is also where we had lunch, under the trees watching the weaver birds flitting into and out of their nests. The dig site was fascinating – tarps cover things from season to season (they weren’t digging at the time we were there). There are more than 3 dozen of these caves where they are unearthing huge numbers of fossils each year. These caves were found originally in the search for gold. Instead, they found gold of another sort: history! A great introduction to Africa! From there, we drove back into town to visit our first couple of galleries. The Everard Read Gallery is high-end art, and it was a good introduction to the artistic sensibilities of some South African artists. Lots of sculpture, etc. Across the street was an beautiful new Gallery called Circa. It is a totally amazing building and there were lots of wonderful photo opportunities while we were there. Our first day in South Africa: lapwings, oryxes, giraffes, pronking springbok, rhinoceros, warthogs, weaver birds, 70,000 year old fossils. Today we meet our first group of women to whom we’ll give embroidery supplies. We picked up our guides at the Pretoria Botanic Gardens. From there, we drove to one of the poorest areas of all of South Africa: Winterveld. As we entered the community, we noticed lots of people on the side of the roads – lots of vendors, lots of people waving at us. I imagine there aren’t a lot of tour buses that make the trek into these parts. Selling clothes on the side of the road in Winterveld at a “bend over boutique”. We arrived to an amazing display of colourful embroideries done by the Mapula Embroidery Group! There were hundreds of pieces, large and small, and some of the ladies who made them were in attendance. I bought a few pieces, but was only able to meet the maker of my little giraffe bag. This is Jennifer Makamo. This project was started by Sister Magella and the Soroptomists in Pretoria in 1991 to help women in the Winterveld – named the “throwaway people” by Sue Miller in the Pretoria News. Started with 14 women participating, now over 140 work on making these pieces. Some live entirely off their embroidery work – they are only paid when their work sells – and each person making money might be feeding up to 10 family members. We did our best to help pay these women, and we left them with some supplies to keep on making them. Their pieces have been sold worldwide, including to the Obama White House, and 50 to Oprah Winfrey. It “gives them a reason to be”. Sister Magella in the middle and Janetje, one of the Soroptimist founders, on the right. I think the woman on the right is Tswane. Two of our group from Canmore managed to involve the Lions and Rotary clubs to help them bring reading glasses from Canada. They brought HUNDREDS of glasses! There are two artists who draw most of these pieces – drawn with crayon on black cotton. The motifs are outlined, then given to the women to fill in with embroidery stitches. 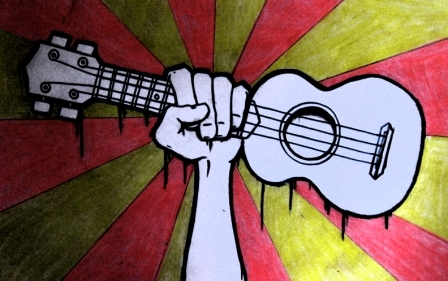 One of the artists is a man who sometimes draws very political pieces. This is a new one all about President Zuma and the current state of politics. The women dressed up for us – they were beautiful in their traditional dresses! Before we left Pretoria we stopped in at the Union Buildings, the official seat of the South African government and office of the President. This is where a remarkable 9 metre high statue of Nelson Mandela, erected in 2013, welcomes the world into his embrace. His “Rainbow Nation” dream is still alive in this country, even though the way seems to have been temporarily lost. Day 2 in Africa: We begin to learn about the wide divisions between the “haves” and the “have-nots” in South Africa. We learn there is hope in the poorest areas. We learn that people here Think Big! Hamba gashlei – Zulu for “go safely”. It’s been ever so long since you last heard from me! Sorry about that – as you’ll see below, it’s been very busy. John and I have recently returned from a trip of a lifetime, and because it has some quilting content, I have decided to tell you all about it. We were away for 3 months in all – if you’ll remember, we are no longer doing our long driving tours, but that doesn’t mean we don’t want to travel any more! We started with 5 weeks in Australia, seeing good friends from Sydney to Brisbane, Canberra to Melbourne and Adelaide, followed by a flight to Darwin and another flight to Perth. We then joined a 21 day guided tour in South Africa, followed by three weeks in Europe and the UK. The original reason for this trip was to help John celebrate his birthday in Australia. This birthday lasted for at least a month, since he kept getting more cake every time we turned around! On the day itself, we were in Tamworth, the country music capital of Australia, and we had to get this picture of all of us (we met Aussie friends who live in BC) in front of the famous Golden Guitar! Some quilty highlights (not much singing involved in this trip) included giving away a new quilt from fabric that our friend Barb gave me years ago to make into “a pillow or something”. I have a new theory: the longer it takes to give back a piece someone asks you to make, the nicer the final product needs to be! The “pillow or something” ended up as a medium sized wall hanging! It was hard to find more unicorn fabric that wasn’t “girly”, but John found some on line, and I was able to make this. I was happy with how it turned out, and Barb was too. We visited friends in Brisbane, and headed back down the highway through lots of rain. One should never complain about rain in Australia EVER, but we ran into one flooded out highway and had to divert inland to find another way south – we still had trouble, and are lucky we didn’t float away! It was after we left that the cyclone hit, and there was flooding everywhere. We’re lucky to have gotten through when we did. The rain followed us to Canberra, but didn’t interfere in our busy social schedule! One night we got together with quilty friends there, including Michelle Law, who used my pattern of 1/2″ hexagons to make her own version of my “Seven Garden Maze”. 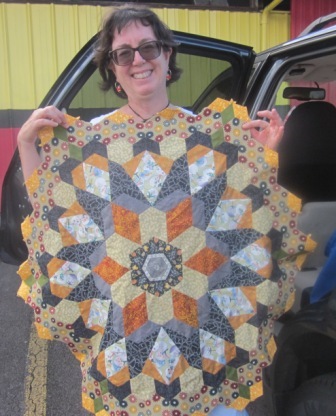 I love what she’s done with it – and she deserved to receive the ribbon at the last quilt show for it. Michelle, Donna, Jenny (the famous Jenny Bowker!) and Kathryn are all extraordinary quilters and good friends, and I’m happy that I got to see them all together in a small group. We had some amazing show and tell that evening, as well as a wonderful meal. Our travels took us on down to Bega, Bairnsdale, and Melbourne. We had the chance to wander about downtown Melbourne, around Federation Square with our friend Judy. We really wanted to see the graffiti alley, just across the road from the Square. We had been seeing graffiti everywhere in the city – they seem to really encourage it. Some of it is horrible, like any other graffiti that most cities paint over. And then we got to Hosier Lane! From Melbourne we decided to repeat one of our favourite drives in the world: The Great Ocean Road! Cloudy still, but it didn’t rain on us that day. By the time we got to Adelaide, the rain had left us behind, thankfully. In Gawler we visited friends who took us out to an Aboriginal celebration of the great Murray River that night. These people had travelled the length of the river doing these celebrations along the way, and this was the last one, at the Murray River mouth. We were quite honoured to be there. Our friends in Adelaide live in the Hills and have lots of wildlife around their house. I’m very happy with this picture of the iconic kookaburra who is one of many who visits them every day. I was very lucky to be in town for the South Australia Quilters’ Guild meeting! Raelene and I went after dinner, and it was great to see some familiar faces in the crowd. We’ve sung for them a couple of times, and I got up as “Show and Tell” and sang a song for them. I have no quilts with me, so I have to just sing! They had a huge show and tell of quilts – if I remember correctly, these were the result of the mystery quilt bags – multiple designs with different fabrics. For $40 you get a bag and make up the quilt. If you have a group of 20 making them, the organizers will come over and teach the pattern for free (and bring chocolate too)! This is a big guild, and I was interested to see how they were keeping everything fun and new for their members. As a guest, for example, I was whisked to the front of the line to sign in and given a private tour of the room by one of the executive members. Nice touch. We flew up to Darwin for a few days. This is where I wrote the first quilting CD, and I have some very close friends there. We stayed with Alison, a marvelous quilter, who showed me a couple of her new quilts. The circular hexie one is a pattern by Geta Grama that I’ve been thinking about making some day. I was thrilled to hear that Paperbark Woman – a shop that specializes in Aboriginal fabrics – has re-opened after a long time being closed. Lenore is the one who talked M&S Textiles into making Aboriginal fabrics, and introduced them to some of the artists. 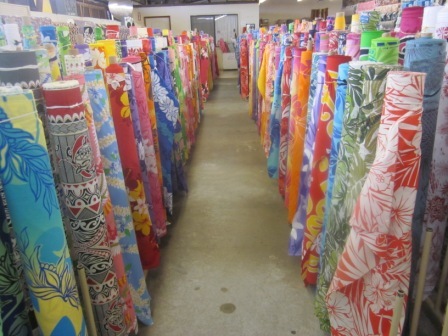 Her whole shop is full of the fabrics, and many of them I hadn’t seen before. Yes, I came home with some of them! The stories about the designs are included when you buy the fabric, too. One last stop in Australia – Perth for 5 days to catch our breath and prepare for the next leg of the tour: South Africa! Our friends Andy and Vicki had this on their counter: I have never before seen Vegemite flavoured chips!!! They were pretty good, too. We spent a day as tourists out at Rottnest Island – never been there before! This is a destination for vacationers – lots of lovely beaches, and fun stuff to do, but not overly developed. People go there and rent cottages for a week at a time. It’s a fairly long ferry ride out, and we hired bicycles to wander around the island. The island is famous for one of smallest marsupials in Australia: the quokka. There are signs everywhere to keep away from them, to not feed them, but that doesn’t stop the visitors. I kept thinking what would happen if people do that in North America – any wild animal you could snuggle up to here would bite you! I have obviously left out quite a bit from this section of the trip – we had a lot of wonderful visits with good friends, ate a lot of good food and drank a lot of good wine. I’m going to continue in the second installment about the jewel of this trip: three amazing weeks in South Africa. As unbelievable as it seems to me, John and I have now completed our last Big Driving Tour. The car has been emptied out and things are put away. Maybe now I can actually unpack my stage clothes and quilts. I found all the fabric I bought during the tour – see the last picture on this blog post. Here’s a recap of the tour from September 11 to November 22nd, 2016 (I know this is waaaay late!) – pour yourself a cup of hot brown drink; it’s a long one! We started to see some lovely colours through the mountains in Wyoming, through the Snake River Valley, just south of Jackson Hole. It’s unusual to see red maple leaves in the mountains. Steamboat Springs was our first stop, and I taught a Mock Mola class there. It’s a ski town in the mountains in Colorado, and we both said we could live there! It was a small class, and they did great work! From there, we headed across the final mountain range to Colorado Springs. Absolutely gorgeous drive through Rocky Mountain National Park, above the tree line. None of our pictures fully capture how astounding the scenery is there. I’d highly recommend it to anyone looking for a great drive. In the summer. In Colorado Springs, another class! After class, we spent another couple of days in town, hoping that we could have a balloon ride. The first two days were too windy, then it looked like it was a “go” for the third day. Unfortunately, someone (who may or may not still have his job) neglected to refill the gas tanks of our balloon, and we missed out – AGAIN!!! Maybe sometime we’ll get up in a hot air balloon; we’ve now tried 6 times without any luck. This is the closest we’ve ever gotten to getting airborne in a hot air balloon! We had a bit of time before we had to get to our next show in Kansas, so we turned into tourists for a while. We stopped in at a couple of presidential museums on the way. In all, we visited 3 official presidential museums on this trip. Fascinating, to learn of the history behind each presidency. (L to R): Eisenhower statue in Abilene KS, me with Amelia Earhart (I know, she wasn’t a president, but we went anyway) at her family home in Atchison KS, and John with Harry S. Truman in Independence MO. Another class in Leavenworth KS. Our show in Leavenworth was small but enthusiastic. Connie and Maria did a great job organizing the event. This is Vicky, Kim, Connie, Shari, and Denise displaying their stunning work at the end of class. After Leavenworth, we stopped in to Hamilton MO on our way east. This was a Highly Recommended Stop, for a quilter! The big mural in Hamilton MO signifies the Town that Quilting built. It seems like the entire downtown is one big quilt shop! It’s not, though – it’s TWELVE quilt shops! Yes, this is the home of Missouri Star Quilts. We paid a visit to the Lincolns (Abraham Lincoln Museum and Presidential Library) in Springfield IL. It’s a very good museum, but of the three we visited, we liked the Eisenhower the best. There was an amazing map in the Lincoln Museum, though, that was worth the price of admission: it is an animated map of the US, detailing all the major battles and territories held by each side throughout the Civil War – the entire history in 4 minutes! Can you spot John hobnobbing with the Lincolns? From Kansas we drove through to southern Ontario for the month of October. There are always lots of people to see there, including many family members. Our first show and class was in Burlington ON. I’ve written a song about the Burlington Teen Tour Band quilt (“Boots and Bayonets”), and it was great to sing the song for them again. The class the next day was very creative and fun. I have a very old friend who lives in Burlington – in fact, I used to babysit her kids when I was growing up in London. We spent a delightful evening with her and her daughter the next night. Here’s a closeup of the “Knoxvilla” quilt. Then we headed up to spend the remainder of the weekend with my other brother. I picked up a new sign for him when we were in Texas earlier in the year (thank you, Paul Hewitt!). Doug would not be a Republican, if he lived in the US, hence the look on his face! I love this picture of him! The leaves were just getting started in the near-north of Ontario, and they continued for us for the next month. I have so many pictures of the gorgeous fall leaves! I’m sure there will be a confetti-appliqued fall colours-themed quilt or two in my future. We had lots of shows in Ontario: Orleans, Algonquin Highlands (Haliburton), Whitby, and Richmond. Then we crossed over to the US again to complete the tour. Erie PA was our first stop, and I taught a class for them as well. I love glass. Stained glass, blown glass, fused glass, any kind at all. We’ve been able to visit a couple of glass museums over the years, and took the opportunity to stop in Corning NY at the largest glass museum in North America. Corning – the inventors of Corningware, Corelle dishes, and Fibre Optics. At the museum is a working glass-blowing studio, and many displays about telescope and lighthouse lenses, safety glass for automobiles, history of glass making, modern art glass, and computer display glass. Four hours is not enough for this museum! And the gift shop is the whole bottom floor of the building. Since we were there just before Halloween, they had all their blown pumpkins on display. Then we had a week off to explore the Washington DC area. On our way, we stopped off in Mifflinburg PA to visit Verna’s Quilt Shop. It’s in a Mennonite/Amish area, and here’s the view from our car window on the way to the shop. School bus and horse-drawn carriage. Verna’s is chock full of fabric. If you want to use their restroom, it is a one-holer out back! A this point in the tour, we became TOURISTS! 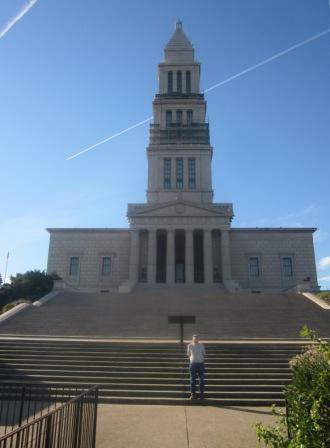 We spent a week in Arlington Virginia, and took in a lot of things in the area, beginning with the George Washington Masonic Memorial. 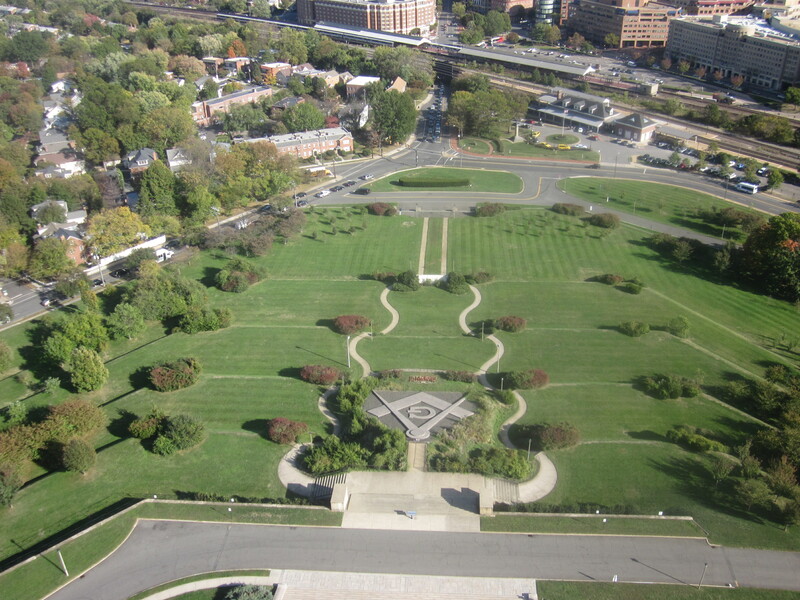 There was a stunning view from the top of the memorial. 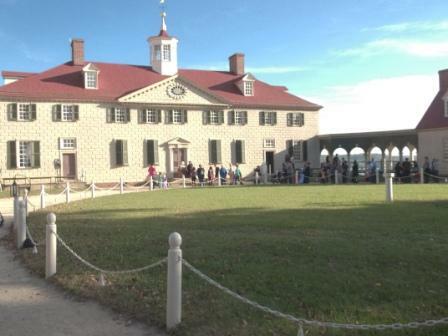 It was the Saturday before Hallowe’en when we went to Mount Vernon, George Washington’s house. The place was overrun with children, all dressed up for trick-or-treating! There was a lineup to get to meet “Martha Washington” on the front steps of the house. 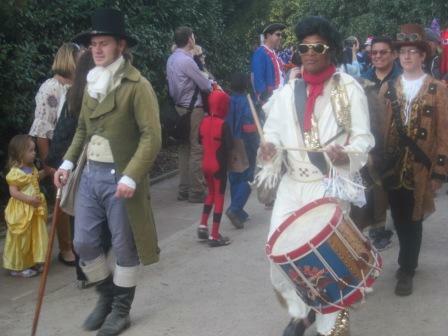 Yes, Elvis made an appearance! 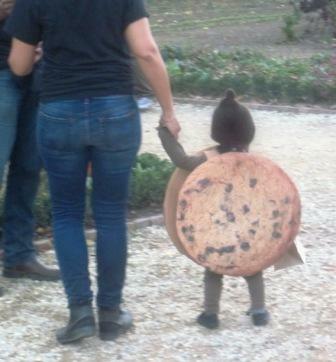 This little chocolate chip cookie was my favourite costume of the day! It was final preparations for All Saints’ Day at the Museum of the American Indian, and Day of the Dead performances and celebrations were in full swing. What an amazing building, designed by Canadian Douglas Cardinal. View of the museum from outside. This is the view of the ceiling of the central hall. There were performances all day long, and, from the fourth floor, we caught a bit of the ukuleles from Hawaii. Beautiful day in the national capital! The fall colours had followed us from Ontario, and were starting to blaze in DC as well. We saw lots at the Arlington Cemetery in our visit there. Our tours took us to the FDR monument, which also sported some fall colours. Above are three pictures of our day in Washington: the gigantic Martin Luther King Jr. memorial, a section of the Berlin Wall at the Newseum (well worth the visit – there’s so much there! ), and one of me sitting in a Parks Canada “red chair” in the echo rotunda at the Canadian Embassy. Then, it was back to work! I taught a class in Lewes, Delaware – a “Hexagons: State of the Art” workshop. It’s a bit of a sweatshop, especially in the morning, but everyone gets to try out different ways to make hexies using many techniques. In the afternoon we play with fussy cutting fabrics using the Lucy Boston templates, and beautiful things were created! I also taught a Mock Mola class in Williamsburg VA, and got to see an old friend at the same time: Freda Atkins. Then, it was a huge drive WEST! Seven days later we stopped in Havre MT at the quilt shop there, and as we approached the border to cross into Canada again, this is what we saw out the window. Our friend Pat Ruby hosted a dinner where I got to invite some of the good friends I hadn’t seen much of since I moved to Victoria in 2000. What a night! It was just like it used to be, with lots of laughing and storytelling, but somehow everybody is looking much older. How did that happen? One last show and class at My Sewing Room before we headed home. We stayed with Robyn (on the right), a fellow engineer who knew John in Yellowknife – and a sewer of great skill. We laughed a lot with her, too, and I got to take a yoga class with her and her partner while I was there. A last familiar road over the Rocky Mountains, ending with a ferry ride and our own bed for the first time in 10 weeks. After I unpacked the car, I found all kinds of fabric I had stashed in various nooks and crannies during the tour. It was just like Christmas!!! And that’s it! Thank you for reading until the end of this very long missive. It was a lovely tour, and a great way to end 16 years of touring this program. We got to see lots of old and new friends, took in a lot of touristy stuff, and enjoyed mostly great weather. Thank you to all who made it memorable, comfortable, and enjoyable. I hope to see you again. John and I just returned from a fantastic week in Alaska. We were there to sing and teach at the Valley Quilters’ Guild in Palmer. We were very well taken care of by the gals at the guild, in particular Jessica, Julie, and Glenda. We have been to Alaska before. In February of 2006 we flew up to Juneau and sang there and in Ketchikan. That’s when we took the ferry up to Skagway to see the Duck Neck quilt (which I wrote a song about). We also did a cruise in 2010 up to the Panhandle which stopped in the same places. But we’d never been further north in Alaska, and that’s where we went this time. We flew into Anchorage and Jessica and Julie picked us up to begin our adventure. The Mat-Su Valley is the heart of agriculture in Alaska. It began with an experiment back in 1935 when the New Deal sent settlers from Minnesota, Wisconsin and Michigan to form a colony. We were told it was an experiment in communism – or perhaps communalism – but most of them left the next year, likely for various reasons. BUT there are lots of farmers there today; the valley is known for HUUUUUGE cabbages and various other produce. Everybody had something growing, either outdoors or in a greenhouse with the very long days but short growing season. We spent the next day with Glenda and her family. They took us up to Hatcher Pass, where we wandered around an abandoned gold mine, once the 2nd largest in the state. The views from up there were tremendous. Before returning to Palmer, we stopped in at a reindeer farm. This is a tourist trap, and they do play up the Santa connection (though there was none with a red nose!). You do know, don’t you, that all of Santa’s reindeer were female? Male reindeer lose their antlers in October. This time of year, they all have fuzzy antlers – they are growing about 4″ a day and they are very sensitive. The fur grows on the skin that covers them as they grow. When the antlers stop growing, the skin dries up and falls off. They also had a herd of elk (same species, but the wild elk are larger) and a sole bison, who had been raised with elk and thought of himself as one! It was fun to visit the farm and to feed the reindeer. We sang for the guild the next day and did a Mock Mola class. The day was very long, but it was never dark – there are 18 hours of daylight this time of year. The next day was another day off, and we drove down to Anchorage with Jessica and her husband Dave. They have a great museum there, with really good exhibits on the development of Alaska. We did stop for some chocolate sustenance at the Alaska Wild Berry Products shop, where they have the tallest chocolate waterfall in the world (whatever brings in the tourists, I guess….). Alas, you can’t dip into it. From there, we headed down to Turnagain Arm. It was named by William Bligh who served as Captain Cook’s sailing master on his last voyage to the north Pacific (right after that, he went to Hawaii where he was killed by the natives). When he realized that this waterway didn’t get him to the Northwest Passage, and they had to explore two arms of it, both leading to river mouths, he called it Turn Again. It’s beautiful, but it’s also a great place to see a tidal bore – 2 1/2 hours after we were there! The next day was a Notan class. Here are some of the pieces created (mostly on paper) during class. Then, we were on our own for a couple of days before heading back home. We rented a car and headed north to Denali National Park! Our plans had us staying a couple of nights near the entrance and taking a day-long shuttle bus into Eielson Visitor Center. We hoped for good weather. Our first view of the mountain came as a surprise. We had caught glimpses of white-topped mountains through the clouds and kept saying to each other: THAT’s Denali. No, THAT’s Denali! But when we did see it, near MilePost 132, it was absolutely unmistakable. It towers over all the other mountains. At 20,310 feet, it is the tallest mountain in North America. But if you want to climb it, it is taller than Everest because the climb starts much much closer to sea level than does Everest. This is July and it’s still totally covered in snow and ice. We got up early the next morning and hopped on the 7am shuttle. It is not possible to drive in the park for most of the year. In the fall, they have a lottery to allow 1500 cars to drive through the park, and the locals jump at the chance. For us, it was better to just sit back and look for wildlife instead of concentrating on the gravel road ahead. Our driver came on the PA system to tell us “up ahead is the ‘Mile of Terror'”! Halfway up the side of a mountain, the road has been perched on top of scree – the tumbledown rocks on the south slope – not the most secure looking driving surface. It was thrilling! And a whole lots of absolutely gobsmacking scenery, full of huge views and grandeur. At the Eielson Visitor Center we got to see a quilt I’ve admired from afar, made by Ree Nancarrow. It’s in four large pieces and it’s called “Seasons of Denali”. This quilt started as white fabric which Ree dyed, painted, stamped, silk screened and appliqued on top of to reflect the wildlife in the park in all seasons. It took her a year of hard work to make it, and it is magnificent. It more than made up for the fact the we couldn’t see the mountain at all from our vantage on that day. But we did the next day. On our way back to Anchorage, it was totally clear. This was such a wonderful experience, and I would highly recommend it to you; even if you don’t like camping, you can savour the joy of being driven on one of the most exciting and beautiful roads in the world through pristine wilderness. 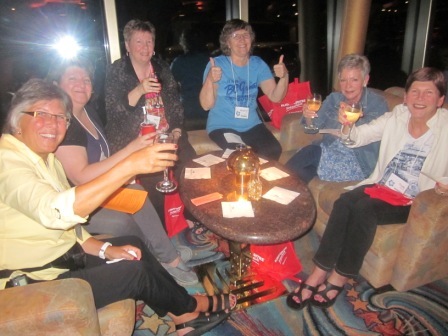 So, thanks to the Valley Quilters Guild, we got to have a superlative experience. The last night before our plane home, we had dinner right beside the float plane base. Float planes are essential transportation in the far north, and it epitomizes the end-of-the-road-and-into-the-woods ruggedness of Alaska. Last year we made the announcement that 2016 would be our last year of significant touring. At the end of this year, we will be “hanging up our car keys” and only available for short “run outs” or flying tours – we will be more particular in the gigs we do. It is the end of an era. Since September 2000, we’ve been on the road for between 6 and 8 months every year, mostly by car. It has taken us through every province and state in the North America, throughout Australia and New Zealand (both Islands, top and bottom), England and Scotland, and Europe (France, Germany, Belgium). We get to big cities and little, urban and rural, and get the advice from friends and family for “must-see” places to go while we’re in the area. It has been beyond wonderful, and the end of it is certainly bittersweet for me. We’ve just returned from our spring tour, which took us to Texas, Oklahoma, Arkansas (FIRST TIME! ), Arizona, Florida, Georgia, Kentucky, Ohio, Michigan and Massachusetts. We have only one more state to sing in to complete all 50: Mississippi. This time I’ve kept a personal journal to keep track of every day of the tour – so I can remember the joys (and the challenges) of this kind of life. Mostly, the joys. We are huge fans of the Eagles (best road music EVER!) and had to stop off in Winslow Arizona to pay homage to the song “Take It Easy” by Jackson Brown. 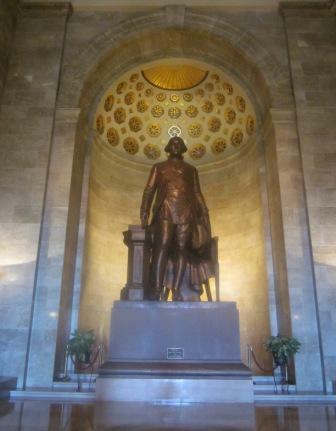 There’s even a statue of him at the corner. We now have (yet another) new Eagles “best of” CD for the car! The picture above was taken at “Cadillac Ranch”, just out of Amarillo TX, where everyone was spray painting these upended Cadillacs. The paint is so thick on these cars that it looks like it’s dripping! The best part of driving Route 66, though, was definitely just east out of Albuquerque New Mexico. Our Air B&B hosts told us about the Singing Highway. As you approach Tijeras NM from the west, there’s a rumble strip embedded in the road that plays “America The Beautiful” – but ONLY if you’re doing the speed limit! Sponsored by National Geographic, it is the coolest thing we found on the whole tour. We did a lot of shows and classes on this tour, and it was very busy at some times. We did find a few days off in Atlanta Georgia, though, where I got to meet a second cousin for the first time, and visit both the Jimmy Carter Presidential Library and the Martin Luther King National Historic Site. Both places were deeply moving. Our next real touristy time was in Nashville TN, when we got to take a tour of the Ryman Auditorium. This is the original venue for the Grand Ol’ Opry, and the inspiration for Prairie Home Companion (on NPR). They were setting up for the last performance at the Ryman for PHC the next evening. Beautiful, historic venue, still hosting great shows. We even got to see a concert with Emmy Lou Harris while we were in Nashville, courtesy of the gal working the door at the Winery there. After that, it was pretty much full-on. During our time in Lexington KY, Bowling Green OH, greater Detroit MI, Ann Arbor MI and Boston MA, we had very little time to sit back and relax. But we still got to see some family members, got awakened in the middle of the night by a hotel fire alarm, visited the amazing Henry Ford Museum in Dearborn MI, and dipped our toes in the Atlantic Ocean at Cape Cod. Here are some pictures of the classes I taught during this tour – there were so many! I was thrilled to have had a sponsorship from the Hobbs batting company for ALL of the black batting for my Mock Mola classes. It sure filled up the car, but was very very much appreciated. The first slideshow is from all the Mock Mola classes on this tour. And finally, here are some of the Lucy Boston blocks that were designed (and ready to sew) during the “Hexagons: State of the Art” classes. Our next adventure will take us up to Alaska in July. Then: one more 2-month tour in the fall! Thanks, everyone who helped make this tour absolutely exceptional! I hope our paths cross again sometime. The bags are getting packed, the kits are all finished, we’ve amassed a bunch of door prizes, and your sewing machines await! I’m practicing the ukulele, and bringing along a bag of quilts for my show and tell for the concerts. 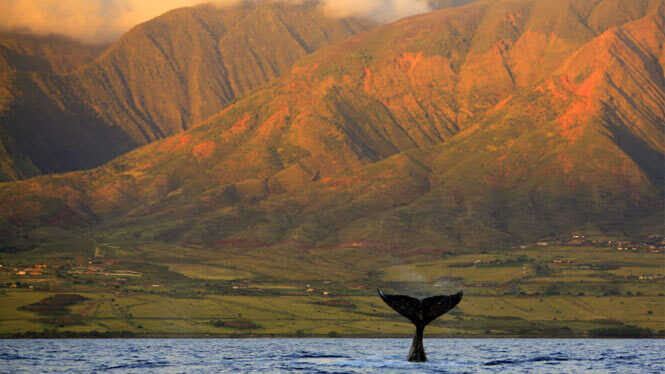 In one week we’ll be embarking on our 15 day dream cruise to Hawaii! As you’re packing, remember that Hawaii no longer uses plastic bags. If you’re planning to do some shopping, you might just throw in a cloth bag for your use there. They’re always very handy to have anyway. I’ve been checking the weather and it looks as if we might get some rain while we’re there – it won’t be cold, just wet, so bring along some rain gear (unless you intend to live in your bathing suit!). Rain is the reason we’ll see so many beautiful flowers in Hilo and on the other islands, and if you live in the west, this summer’s drought means you will never complain about a little rain. What else do you think you’ll need for this cruise? Leave a message in the comments below. It could be helpful for some of your fellow cruisers. Enter your email address to subscribe to Cathy's blog and receive notifications of new posts by email.